When a New ticket is assigned to an agent, the ticket status automatically changes to Open. You'll see the change after you update the ticket. Once a ticket's status has been changed from New, it can never be set back to New. If a ticket's status is set to Pending, Solved, or On-hold, and an end-user comments on the ticket, the ticket status will be set to Open. A ticket's status cannot be set to Solved without an assignee. Ticket type is not editable. Once a ticket has been assigned to a group, it cannot be reset to no group. Once you set a priority, you cannot reset it back to no priority. You can always change it to a different priority. When a ticket's status has been set to Closed, it can never be updated, it can only be deleted. Instead, the requester can create a follow-up request that references the closed ticket. If there's only one agent group, all tickets are automatically assigned to that group. If there is only one agent in a group that can be assigned tickets, all tickets assigned to that group will automatically be assigned to that one agent. Some agents in groups, such as light agents, do not have permission to be assigned tickets. You cannot assign a ticket to an agent without first assigning it to a group. Tickets are automatically closed 28 days after they're set to Solved, regardless of any triggers or automations. Hi, how can I 1. reset these rules if they have been modified and 2. How can I change the fact that an agent can create and submit a ticket without having an assignee? (by submit I mean as open or pending not solved). Thanks! The inborn system rules are part of what make Support function. They are an integral part of how many different aspects of Support work and as such, they can not be changed or modified in any way. Regarding your second question, you maybe be able to make a trigger to capture any agent created tickets without an assignee. You could have this trigger either send out an email notification to that agent or to a particular group, or have it assign it to that current user. In our system, why our customer replied, and the ticket status does not change to open? You'll want to check your triggers! Most likely, you have one more triggers set up that prevent that status changing on customer response. Feel free to post screenshots of your triggers if you're not sure what's going wrong! @Claire, thanks for your feedback yet please bear in mind that it is not 100% accurate. Once a ticket has been assigned to a group, it cannot be reset to no group. You can, however, change it to a different group. Similarly, once a ticket has been assigned to an agent in a group, you cannot reset the assignee to no one. You can assign it to another agent. It's definitely possible that your agent either created a ticket in a pending state, or even replied to a ticket without setting assignee. The only time you are required to have an assignee is once the ticket is solved. Any time before then, an assignee is not required. I have a question about group assigning. If an agent is in several groups you have to pick a default group. So say the agent is part of the Technical Support and the Billing Support group. With Billing set as the default because they work mostly in that group. That technical support ticket is now assigned to the billing group because it's the agents default. Is there a way to stop this or change this? Does this matter at all in reporting? I understand why it does it, but it doesn't seem right. Can it not just be assigned to the agent and stay in the group it was placed in? My experience is different, I wonder if you should open a support ticket. I am a member of several groups and of course have a default group. If I take a ticket in group B _and_ I'm a member of Group B, it keeps it assigned to that group and me and does not change it to my default Group A. However, if I take a ticket that is _not_ in a group I am a member of, the system assumes I want it in my default group. For us, this does have an impact on reporting, because we want to know which teams handled tickets, how many, etc so we run reports on groups. I don't know if you do the same. That sounds more reasonable. And after playing with it more this is how it works. I guess I need to look more at who it's happening to and see how they are getting tickets that shouldn't be. Thanks for helping out, Heather! How to automatically reopen tickets if the requester is an agent? 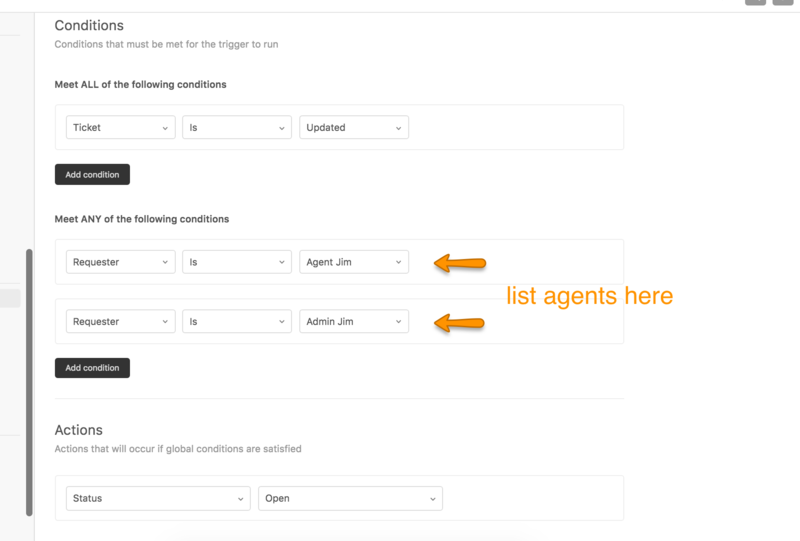 Being that agents have access to the account interface and can set any status they want, there isn't a built in rule to allow tickets updated by Agent Requesters to automatically get set to open. For that you would need to make a trigger to set the ticket status to open when your agents update the ticket and are also the requester. I'm testing and found requester's reply would not change the ticket status to OPEN from any status of pending/ on-hold/ solved. I've checked all my triggers and none of it with setup 'action' to change the ticket status to OPEN. Is that the reason? As I know, this should be the ticket rules as once requester reply to our email, the ticket status shall changed to OPEN. Is the requester on that test ticket an agent account? If so, the status will not automatically change, as the system rule is specifically looking for end-users replying to tickets. Agent requesters won't automatically change to OPEN from PENDING, since Agents have access to the interface and can change the setting as they please. If you do still experience issues, after confirming that the requester is not an agent email address, feel free to reach out to our Customer Advocacy team at support@zendesk.com! I couldn't disagree more with the last one...Sometimes because of SLA's or because of support contracts, the ticket should keep solved more than 28 days...I would understand that it could be flexible between support subscriptions (Team vs enterprise...), but not as a standard rule without any option to be changeable. I've noticed that, ticket status is pending but after several days, it is solved automatically. I'd want to know how long this will happen? This would not be an inborn system rule or a default business rule. Likely this is an automation on your account or it is a result of your customer's solving their tickets in your help center. You can check the event log on your tickets to see what caused this. See Viewing all events of a ticket for more info. Newly created tickets won't necessarily stay in New status when they're created. For instance, if they're automatically assigned to a group upon creation, the status will change to Open (or whatever status is dictated in the trigger that routes them). That's why we have conditions that specify each separately. I hope that clears things up a bit! Let us know if you have any more questions. If the status cannot be left as New after assigning an agent, why is there a submit as New option under the submit button? I know it automatically changes to open after it is assigned, and that is workable, even though it should be the agent/admin's choice, but to show submit as New and have it also an option under submit, is just wrong! After you "submit as new" it just goes to open anyway, or even worse stays as new in the unassigned until it updates. I guess this is just a comment/complaint as I had no actual question. Just an observation that may be a help to others and Zendesk could use to make a good product great! Thanks for the feedback, Mike! If you'd like, you can create a new post in the Support Product Feedback Topic. We use the number of comments and votes on conversations there to gauge interest and need of feature requests and that is one of the data points we use in roadmap planning. Why does a ticket not get reopened when the requester (who is an agent) makes a reply to a Solved ticket?